Holidays provide a great opportunity for companies not only to sell more to repeat clients but also to acquire new customers. Together with a great opportunity to gain, comes a big chance to lose customers in the holiday season if you offer them bad customer service. Customer service is almost always the first impression a customer will have with your company, so it is important to handle it the right way and not scare your customers away. The survey says that 60% of consumers would be “unlikely or very unlikely” to give repeat business to a company that had given them bad service in the past. And repeat customers that continue to support your brand over time will spend 67% more than new customers. So it is well worth it to give your time and attention to managing the busy customer flow well in the holiday season. These reasons may cause you to lose customers before you know it. Hard to contact the company. Either you don’t have a clearly written contact information on the website, or perhaps there is only email. Customers prefer to have options and even today still many customers prefer to have a phone number and a live person to speak to in order to resolve their issue. Limited payment options. Either you accept only cash or only one form of digital payment with limited options. Customers want to have a choice and if they are restricted in payments, you may just lose their business, because they will not strive hard to make that purchase with you and will buy from competitor instead. Restricted hours of operation. Especially in the holiday season customers want to be able to order at any time and have support round the clock. Extending the hours your customer service is available is crucial to gaining their trust and business. Having to interact with poorly trained staff. We all know how a busy holiday time can be stressful. Customers may feel in a rush and they want their questions answered fast and problems resolved right there and then. Incompetent service will drive them away from your company, and perhaps not only for the holiday season. Complicated return and refund procedures. We all buy a lot of things during holidays and well, some of them are not a fit. Holidays are also the season companies get the most returns. If it’s a pain to return the product and get a refund with you, the customer will remember their experience and perhaps not only stay away from purchasing from you in the future but also share his feedback and review online and spread the word. Being unresponsive is probably the worst thing you can do to scare your customers away. They get really aggravated by this. Well, all of us do, don’t we? Even if the issue is not resolved timely and properly, but the customer gets a response and apology, his or her opinion of you will not be as negative as when their communication just gets ignored. Selling poorly made products at lowered prices or products with defects. If your product or service failed to meet customers expectations, it will be hard to remedy. Disappointed customers are likely to share their negative feedback with friends on social media. And angry customers will post unflattering reviews for other prospective customers to see. So make sure you design and build a high-quality product or service before entering the market. Making the customer feel unimportant by not returning their call or not acknowledging that they are a regular customer. Offering something extra, a special treatment for your customers is a great way to let them know they are valued, and it’s one way of making their customer experience a little better. You can offer some incentives and promotions to keep clients assured that they are important to you. You can run a survey to get some great ideas as to what they might like the most. They’ll appreciate your acknowledgment that they were so important to your company that you asked for their input. These are just a few most common things that make the companies lose their valued customers. They are quite easy to fix, but it takes time and commitment. Hopefully, this holiday season will allow you to create many strong and long-lasting relationships with your repeat and new customers. What else would you do to earn their trust and keep their business? Please feel free to share your feedback in the comments. 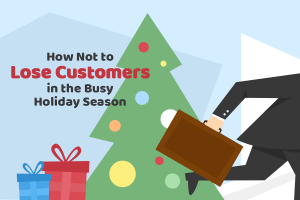 This entry was posted in Articles, Tips and Tricks and tagged customer loyalty, customer service, how not to lose customers, how to keep customers, managing customer flow in the holiday season. Bookmark the permalink. On holidays, you can easily increase your sales several times. The main thing is that your managers listen to the advice described in this article. I believe that it is more important than winning new clients to give maintenance and attention to the customers that the company already has.